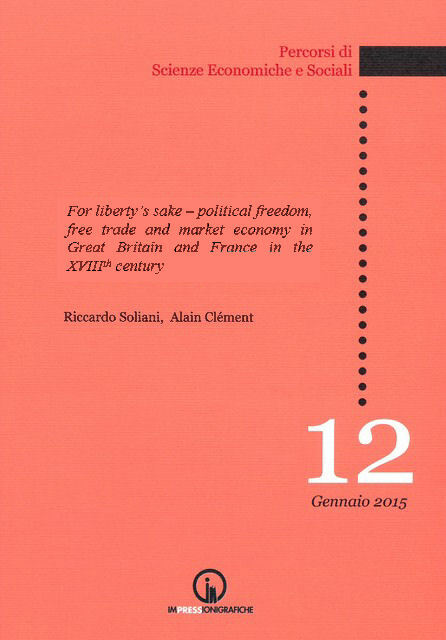 This book deals with the relation between institutions and political liberty, on one side, and free exchange and market economy, on the other, in the xviii century. It compares the prevailing approaches and the debate in Great Britain and France with a multidisciplinary approach, between social history and history of ideas. In Europe the issues of economic freedom and free exchange were connected with the claim for the political representation of the social classes who were establishing the “commercial society”. The really complex knot of interests involved different parts of British and French aristocracy, namely landlords and aristocrats who invested in the colonies, groups of government officials of the British Empire or of French regions, who enjoyed privileges from the regulation of trade, farmers, entrepreneurs who traded exotic commodities or “grain”. In the background, peasants, sharecroppers and poor urban labourers.